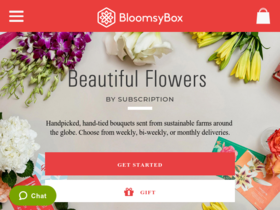 Take advantage of 1 free month (a $39.99 value) at Bloomsy Box with this special offer coupon code. Act fast and enjoy a $5 discount off the month to month plan with this coe from Bloomsy Box. Use this code to save $10 off a 6 month plan from Bloomsy Box. Always enjoy free shipping from Bloomsy Box. Act now and enjoy deliveries from only $39.99 per month from Bloomsy Box. Sign up at Bloomsybox for beautiful flowers delivered monthly. Check out Bloomsy Box online for their latest special offers.